Abstract: Network algorithms are deployed on large networks, and proper algorithm evaluation is necessary to avoid large-scale outages or performance bottlenecks. However, evaluating a network algorithm in a simulator results in significant run times which scale poorly as we increase the number of routers. An alternative network simulator design is desired which scales significantly better than current simulators. 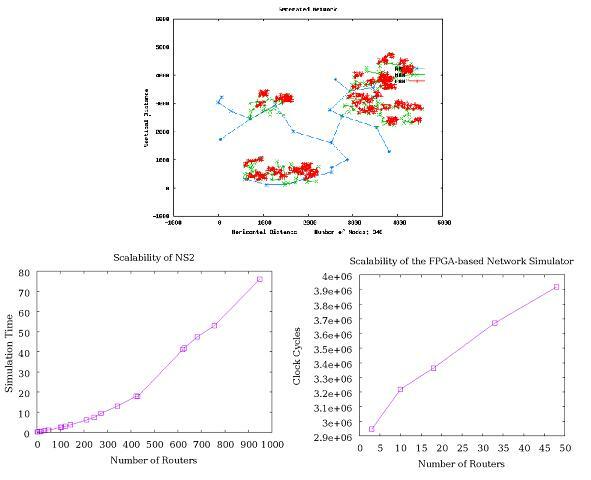 We evaluate the scalability of NS2, a popular network simulator, by generating topologies of large networks and show an O(N log(N)) scalability where N is the number of routers. Then, we propose and implement a network simulator based on reconfigurable hardware and FPGAs, which is shown to scale O(log(N)). However, through implementation we demonstrate drawbacks of our FPGA-simulator, particularly area constraints offered by current generations of FPGAs.